Sometimes we forget how exciting church can be. Our congregation has been involved in serving our community and beyond, since it started on the banks of the Pajaro River in 1852. Part of our past includes making beautiful music. Here’s an article by Jane Borg, Hal Hyde and Marilyn Hyde about the following photo, which we hope will inspire you to join us, as we sing to the Lord a new song! 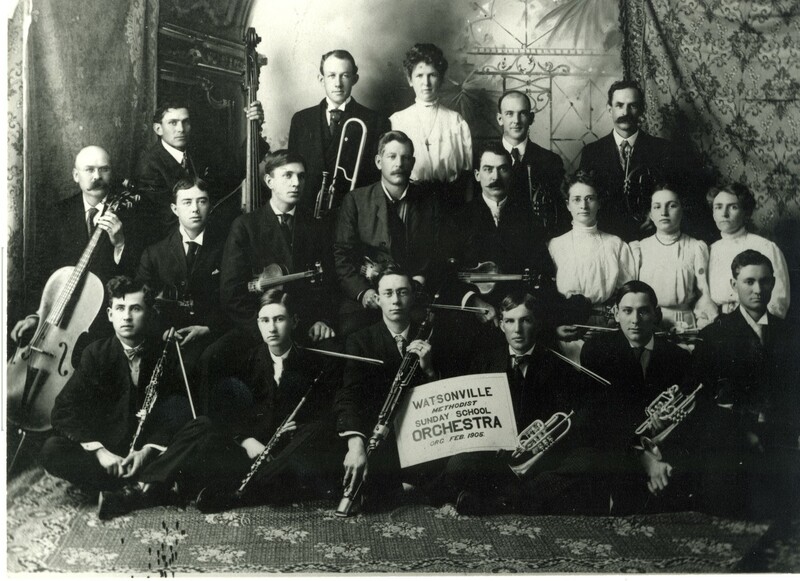 Our photo shows the Watsonville Methodist Sunday School Orchestra, organized in February 1905. In those times, “Sunday Schools” were very large, partly to encourage their meeting in outlying districts, especially during the winter. Overall Church membership was large and Methodists were very interested in music, so a group of this size could be organized. Some participants probably played in other Watsonville music groups, too, such as the high school orchestra, Watsonville City band, or women’s orchestra and band. In addition to church programs, orchestra members could have played in parades, given concerts at the “Opera House,” or performed at the downtown Watsonville Plaza bandstand. At the time of this photo, the First United Methodist Church was located at the corner of Fourth Street (now West Beach Street) and Rodriguez Street, near downtown Watsonville and the city plaza. The orchestra probably practiced in the Sunday School rooms in the annex behind the church sanctuary. This photo included Watsonville civic leader, H.A. Hyde (back row, last right), a Methodist and conductor of the Watsonville City band for many years. His descendants continue to worship with us today. Other early members of the church who could be identified are Mr. Clarence Perry, Mrs. Heron, Miss Dora Bliss, Miss Lucy Bliss, Mr. Fred Dempsey and Mr. Buckhart.